Farmersgirl Kitchen: Cookery School - you saw the series, now read the book! 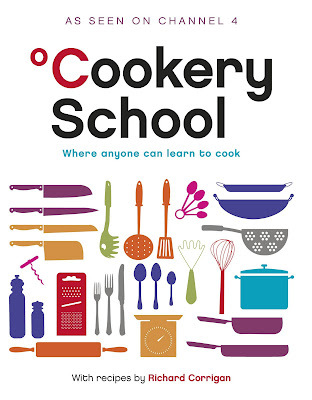 Cookery School - you saw the series, now read the book! I haven't actually managed to watch any of the Cookery School programmes on Channel 4 with Richard Corrigan and Gizzi Erskine, it's on at 2.05pm and I'm at work all day. Our DVD recorder is dismantled because of work being done on in our living room and our internet connection is often very poor so watching on 4oD is not really an option as all I get is buffering every 20 seconds. Anyway enough of my moaning, I hope C4 decide to repeat it in the evening so I have a chance to see it. Anyway I don't really think that has any bearing on my review of the book, perhaps it is even a good thing as I came to the book without any preconceptions. It's a hefty book, full of lovely photographs, I would say it is a book for someone who wants to learn basic techniques which they will be able to translate into their own cooking. What I really liked was the step-by-step technique photos, ideal if you are a visual learner. The recipes are a little bit too cheffy for my tastes but if you are a novice or intermediate cook who is interested in impressing at dinner parties with your restaurant style food - then this is the book for you. My son fits that category, so I am going to give him the book as I am sure he will be able to learn a lot from the technique sections and adapt the recipes to suit his vegetarian girlfriend too. Heat a large saucepan and add the butter and half the olive oil. Once the butter has melted, add the onions, marjoram and 1 tablespoon of the thyme. Soften the onions for 10-15 minute over a medium heat. Add the chicken stock and simmer for 10-15 minutes. 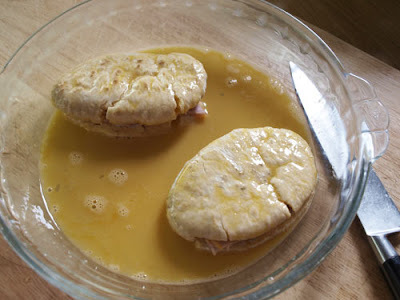 Or split open the mini pitta bread and fill with the ham and cheese then dip into the beaten egg. Place a large frying pan on the heat, add the butter and oil. When melted fry the toastie round over a low to medium heat until golden brown and toasted on each side. Keep warm in a low oven. If you have a large pan you can do them all at the same time; if not, fry in batches, using a little of the butter and oil each time. Meanwhile pour the soup into a blender and blitz until smooth. Remove and pass through a fine sieve into a clean pan (I used a stick blender and didn't bother with the sieve). Stir in the cream (or milk in my case) and season with salt and pepper. Heat the remaining 1 tablespoon of olive oil in a small pan until hot. Add the remaining 1 tablespoon of thyme and cook for a minute then set aside. Warm the soup through and pour into individual serving bowls. 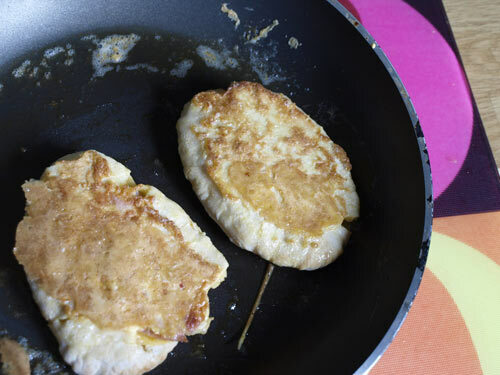 Drizzle with a little thyme oil and serve a warm toastie on the side. 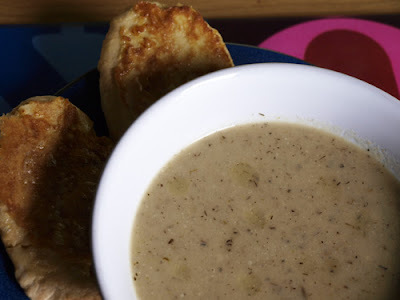 Even without the cream and using dried rather than fresh herbs, the soup was delicious but the little toasties were definitely the stars of the show! 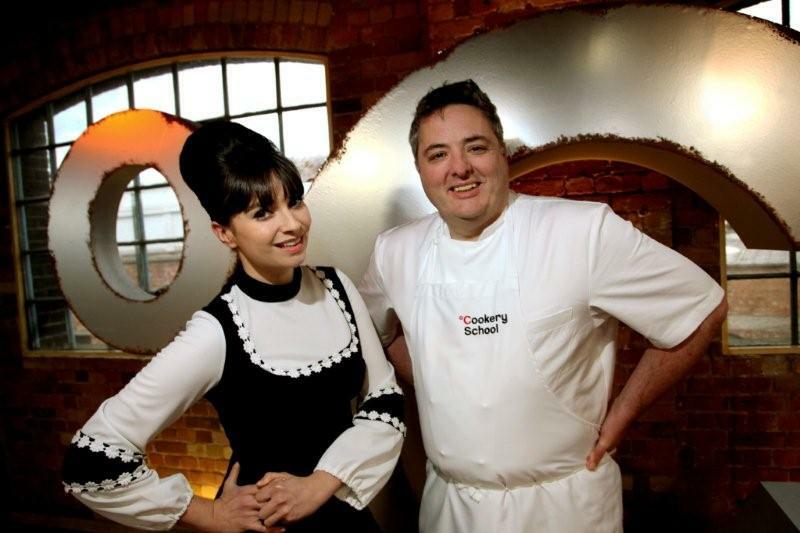 Cookery School is on Channel 4 every day for 10 weeks from the 31st January at 2.05pm. 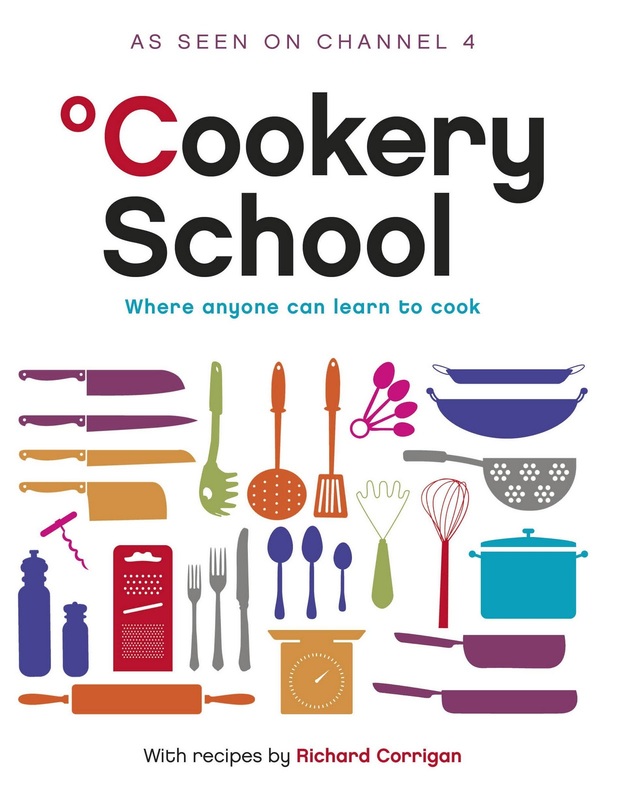 The book to accompany the series ‘Cookery School’, with recipes by Richard Corrigan is available, published by Penguin Books, priced £20. I have to admit to having a very strong dislike of Richard Corrigan and avoid anything he is involved with so I'm not surprised the recipes are on cheffy / showy side. Still its great that you were given the book to review and I am sure there are many out there who will love the man, the book and the series!